I need to clarify that this is not a picture of one of my ebay purchases. 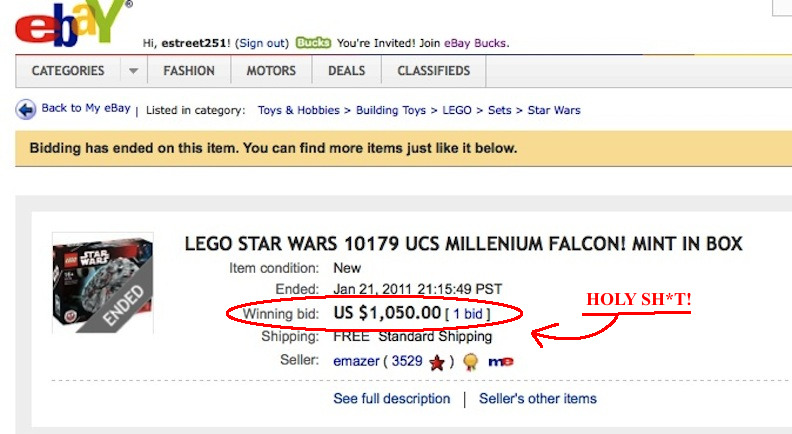 I was researching Star Wars Legos for an ebook I'm commissioned to write, and I came across this ebay sale. "Honey, I'm only planning to spend ____A_____ on one ___B_____!" 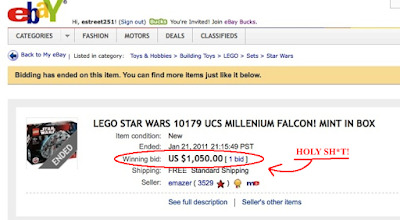 But now I know that during any one of these debates, I can show her this ebay posting and say, "Well, at least I didn't spend a thousand dollars on Star Wars Legos." It's too bad that I'll be following it up with, "Now if you'll excuse me, my 200 dollar Return of the Jedi carded Luke Skywalker action figure just arrived. And if you need us, we'll be at Wendy's."